Music Minus One Violin Deluxe 2-CD Set. By Mario Hossen. By Max Bruch (1838-1920). Sheet music with CD + MIDI floppy disk. Music Minus One. Classical. Softcover with CD. 32 pages. Music Minus One #MMO3172. Published by Music Minus One (HL.400310). For the many of you out there who only know Bruch's first violin concerto, we've got news for you: there are two more, both of them wonderful slices of German Romanticism. 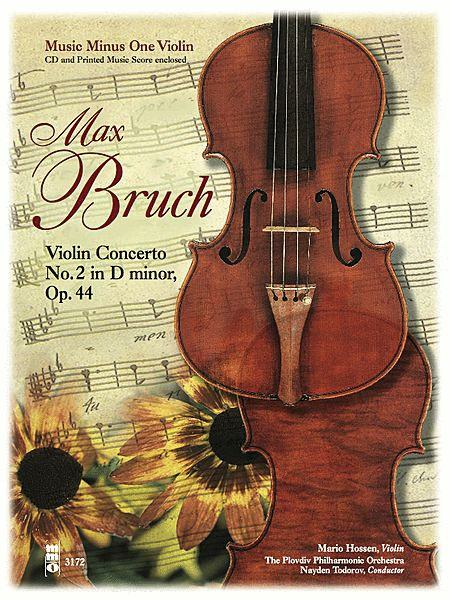 The second, while for many years overshadowed by Bruch's first concerto, has begun to gain recognition – you will understand why when you listen to and play its sublime melodies. Includes a mini-master-class and a newly edited edition from virtuoso soloist Mario Hossen. We can't recommend this one enough! This deluxe 2CD edition includes a special slow-tempo practice version of the accompaniment to help you get up to speed while you practice the piece. Includes a newly-engraved edition of the concerto on high-quality ivory paper, edited complete with performance notes by Mr. Hossen; and a digital stereo compact disc featuring a complete performance of the concerto with orchestra and soloist, followed by a second performance minus you, the soloist; and a second compact disc containing a full-speed version of the complete concerto followed by a special -20% reduced-tempo version of the accompaniment for practice purposes. The concerto is voluminously indexed for your practice and performance convenience.